Compound fertilizers are the commercial fertilizers in which two or more primary nutrients are chemically combined. Complex fertilizers are the commercial fertilizers containing at least two or more of the primary essential nutrients at higher concentration in one compound. The nutrients in complex fertilizers are physically mixed. 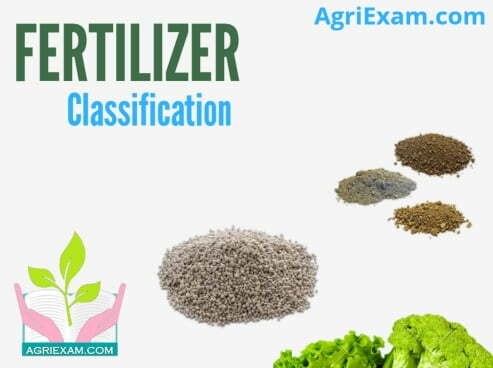 They are physical mixtures of two or more straight fertilizer. Sometimes a complex fertilizer is also used as one of the ingredients. The mixing is done mechanically. The fertilizer mixtures are usually in powder form but techniques have been developed for granulation of mixtures so that each grain will contain all the nutrients mixed in the mixture. Bio fertilizer are the living organisms capable of fixing atmospheric nitrogen or making native soil nutrients available to crops. Atmospheric nitrogen is fixed effectively by the microorganisms either in symbiotic association with plant system (Rhizobium, Azolla) or in associative symbiosis (Azospirillum) or in free living system (Azotobactor, phosphobacterium, blue green algae) or in micorhizal symbiosis (VAM fungi). Azolla It is a small water fern of worldwide distribution under natural conditionsThere are six species of Azolla. They are Azolla caroliniana, Azolla filiculoides, Azolla mexicana, Azolla nilotica, Azolla microphylla and Azolla pinnata. Azolla contains 3.1-4.2% N; 0.16% P2O5 and 0.18% K2O on dry weight basis. Azatobacter The beneficial effects of Azatobacter on plants was associated (non-symbiotically) not only with the process of nitrogen fixation but also with the synthesis of complex of biologically active compounds such as nicotinic acid, pyridoxine, biotin, gibberellins and probably other compounds which stimulate the germination of seeds and accelerate plant growth. Azatobacter population in soil or near the root zone of crops (Rhizosphere) is very low when compared to other soil bacteria. The nitrogen fixation potential of this bacterium is also not very high and appreciable (20 to 30 kg of N per ha per year). Blue green algae- The blue green algae occur under a wide range of environmental conditions. Mycorrhizae (VAM) – Vesicular Arbiscular Mycorrhiza is a fungi used as bio-fertilizer.Mycorrhiza increases crop yield, protect against certain root pathogen, helps in uptake of P, Cu, Zn and B and increases tolerance to environmental stress.